Well the doctor called a few hours ago with the results of the ultrasound and it looks like her Kidney issue is getting better. She no longer needs antibiotics, and she doesn’t need the diagnostic test to see if fluid flows up into her kidneys. They will do another ultrasound in 3 months… This has taken such a huge load off my chest. I feel so much better! Well we’re getting settled into our routine here at home. Kirra is doing pretty good considering a fractured femur. It doesn’t seem to bother her too much, unless you move it accidently. I am doing a lot better too. I was quite emotional and overwhelmed right after her birth, and once we got home. So many hormones flying all over the place, and especially with her leg being broken, and me trying to heal from major surgery was definitely more challenging, emotionally and physically than I thought it was going to be… Plus not going into labor, and having such a surgical/painful birth was different too. On my prenatal ultrasounds she had a dialated left kidney, and it has continued past birth. We went in today to the doctor to get another ultrasound to see if it has gotten better, and it is still midly dialated. This means two things…It could be that she has a mishapen kidney, or she may have a condition called Hydronephrosis, which basically allows fluid from the bladder to go back up into her kidney. It’s very very mild on her tho… we go back to our pediatrician next Tuesday (12/4) and she will decide if she needs further testing… So if it is this condtion… it’s something that you can treat with antibiotics, and follow up with every year and monitor… Hopefully it’s just a mishapen kidney, but if it’s not it’s manageable. Kirra has had a few baths now, and doesn’t seem to mind them at all. I think she will like them even more when her leg fully heals. Also her umbilical cord stump fell off. She has the cutest belly button I have ever seen! Well by now you know that we had our daughter on Monday November 12th, 2007. We arrived at the hospital about 11am to prepare for surgery. The doctor came in and verified that the baby was still breech. (which she was) After this, the nurses prepared me for surgery. (Ok… now I started to get a little nervous, because I knew that it was ‘real’ at this point. After the nurses etc got me prepared, I walked into the OR. The anethsesiologist gave me my spinal block, and we were ready to get underway. They did the pain test to make sure that I wasn’t feeling pain. I could still feel things but at that point nothing was really painful. So the doctor made her inscision, and i could tell that she had made her cut, but it didn’t hurt. Then they started with the levers, and pulling and tugging. That hurt really bad. So they gave me Fentynal which is one of the strongest narcotics known. That didn’t seem to help so they gave me some local lidocaine and marcaine (which is like what you get at the dentist) in the spot. I was still in a LOT OF PAIN. Some of the nurses, etc compared it to intense labor pain! They had never seen anyone react painfuly to the procedure. Usually it numbs you up pretty good. I could hear the anesthesiologist, “here comes baby”, and I did hear the baby cry, and I just cried and cried. The baby was real! I really had a baby in my belly! They brought her over to me so I could see her. She looked soo pouty at this point. But she was definitely cute! Jason and I decided miss K! They told me that her leg was swollen, and that they needed to take her away…After they took her away the lidocaine etc still didn’t work either, so finally they gave me nitrous oxide, and I didn’t care about much after that. After I started dozing off I sent Jason to go check on K.
Monday afternoon they told me that she ended up being in a really really tough position, and was extremely hard to deliver. 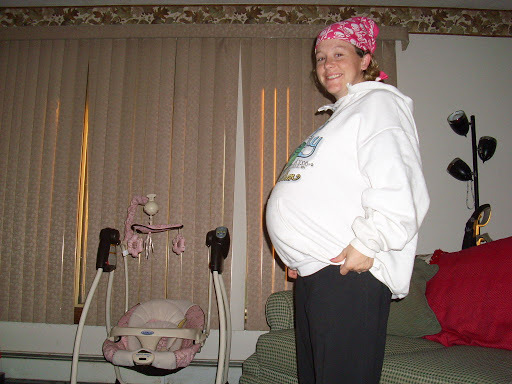 When the doctor was finally able to lift her pelvis out of my abdomen she heard a pop. They did X-Rays on her, and she broke her femur 😦 Poor little thing. At first they thought she would require surgery, and that she would have to be transfered to Gillette that night, but they got a hold of some ortho-pod surgeons, and they didn’t think it was nesicary. But we would need to follow up. She had to live in the level 2 nursery for the entire time that we were there. So it was pretty sad for me (mom). The only way I could go and see her is if I went down there. This I think was the hardest part. I went thru 39 weeks of a less than stellar feeling pregnancy, had a very difficult delivery, and then couldn’t even see my little bunny right away :(. I did manage to get down to the nursery quite a bit tho. So, after major abdominal surgery it was really tough at first, because you’re so sore, and you can’t move… and you feel so helpless… but because I got up so much it actually helped me heal faster. Jason was an absolute MILLION DOLLAR DIAMOND because he helped me SO MUCH! I couldn’t have done any of it without him! Not the pregnancy, delivery, or recovery. He has been absolutely great! This morning (Thursday 11/15/07) we were all released from the hospital and we drove down to Gillette. Nobody told me the first time you have your baby in the car you’re a paranoid mess. I was SOOO scared of everyone on the road. The ortho-pod Dr. E saw her, and fit her for her little brace. It’s kind of like what adults wear if they break a colar bone. Exept for your hips. So… we got her home, and we’re all relaxing now… well I am off for the evening. If anyone wants to call please do so, we’ll be here! You have hereby been evicted from the uterus. You must pack your belongings and remove yourself from the premisses no later than 1:30pm on 11/12/07 or you will be taken by force. Well I will probably start blogging more often about my feelings etc. It seems like this 38 weeks have gone by so fast! Four more days and I find out when the C-Section will be! Yesterday I felt really uncomfortable on my way home from work. The baby was actually hurting me! If these were Brax Hix contractions, I am in a world of hurt if I actually go into labor. However I can’t even be sure that it was contractions, because it wasn’t something that I could time, it was just painful the whole time. My back, and my ribs were hurting to the point of tears! I think she was nuzzling her head up in my ribs or doing something, either way it was not cozy for momma. Perhaps the doctor can scan me again on Tuesday and see if our stubborn baby has decided to do gymnastics and turn herself. (Not counting on it (the fact that she flipped), but it’s a good thought!) Regardless, she (the doc) said before she does the spinal block on C-Section day she will scan me to make sure she (the baby) hasn’t gone to a head-down position, so that’s good at least. I am a bit nervous for the surgury. I’m a little scared about the spinal block, only because that has to be a really weird feeling, of loosing all of your feeling; waist down! Also because I have read that shorter people can sometimes have the numbing agent come up to high, and make them short of breath. I’m sure the doctors, and anesthesiologist will be there, and help me out if a problem should arise. The actual surgury I know will be fine, because I will not feel anything. But the idea of having my arms straped down sounds a bit terrifying, so I am going to ask my doctor on Tuesday if I can leave my arms free, or at least one of them. Jason will be there the whole time, so that is definitely re-assuring. And I am scared for when the numbing agent wears off. Am I going to want to die? Is it going to be the worst pain of my life? I am sad I won’t be able to move around freely during her first few days/weeks of life, but Jason is taking off work to help out, so that is definitely a bonus on my side, plus it will help him to bond with her a little more quickly. I’m nervous, scared, and beyond excited all at the same time!